One of the first ships to be dispatched to the Titanic disaster site was the cable repair ship Mackay Bennett. They were tasked with body recovery and embalming. Having found over 300 bodies they quickly ran out of embalming fluid and was forced to bury over 100 of the dead at sea. Unfortunately, many of these were the less fortunate steerage and crew members. 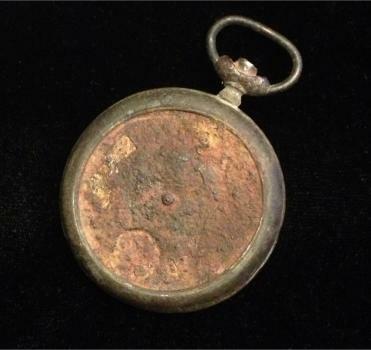 This pocket watch is from an unidentified 3rd class victim (or possibly a crew member) that was buried at sea by the crew of the MackayBennett. It is said that it had "fallen" from the pocket of one of the dead when transferring from a Mackay Bennett lifeboat to the recovery skiff. 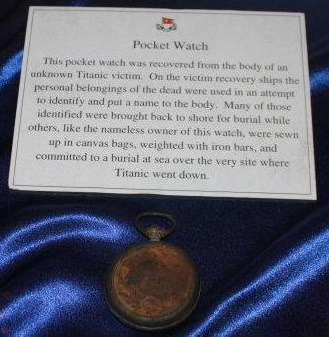 It was quickly scooped up andpocketed. The watch face was made of a very cheap tin and not properly enameled, the sea water exposure to the face caused the extensive damage shown. Rusted remnants of the dials show the watch stopped at approximately 1:50.